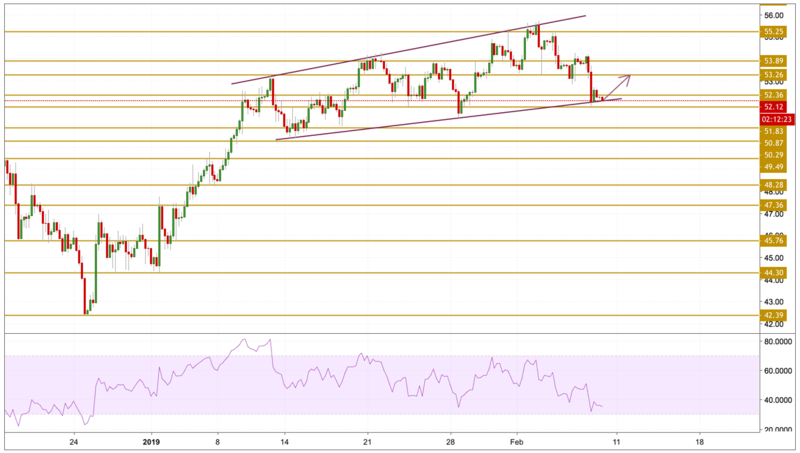 Prices of the West Texas Intermediate once again tested the $54.00 mark yesterday, as traders appear to have re-shifted their focus to the ongoing OPEC+ agreement to curb oil production as well as sources of potential supply disruptions. However, prices dropped significantly in what appeared to be a technical correction. We had the EIA report that revealed a smaller-than-expected weekly fall in U.S. natural-gas supplies while a risk-off tone developed with the Dow falling 350 points to session lows as White House Adviser Kudlow said that there is a 'sizable distance' that remains in China-US trade talks. Crude oil prices dropped during yesterday's session and continue to do so this morning after the upward move was denied by the $54 level again. The price is currently hovering just above the lower band presented on the chart but with a divergence with the momentum that points toward an upward move. The next level we will be watching is the $53.26 level.